When you let your crew know you're rolling down the ave in your Ambassador, chances are they'll assume you mean the Kenosha-built variety driven by the Government Agents in Repo Man (and then they'll diss your crummy two-barrel 304 and roar off in their 390-powered Javelins, most likely, leaving behind nothing but the echoes of their cruel laughter and a gnawing sense of emptiness in your soul). But if your homeboys happen to number among the billion souls living in India, they'll know right off that you're talking about the mighty Hindustan Motors Ambassador and they'll give you the honor of first swig from the Kingfisher forty they're passing around. Based on that pinnacle of British automotive-engineering genius, the 1956 Morris Oxford, approximately 29 trillion Ambys have been pop-riveted together since 1958. Much beloved by Indians for its ubiquity, tolerance for less-than-smooth roads, and sheer staggering volume of available spare parts (and, as the HM site boasts, "It's repairable! "), Hindustan Motors continues to churn them out like Bollywood churns out musicals. 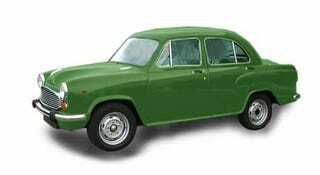 Check out the Hindustani Motors site and study each of the ten somewhat bewildering (and occasionally redundant) reasons to whip out your roll of rupees and hand it over to the friendly Hindustan Motors salesman. And oh yeah- sure as Vishnu has four arms, you just know some enterprising Bangalore mechanic has put a pickup bed on one.